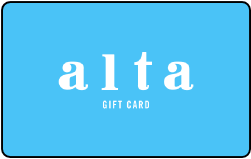 Alta Group gift cards can be picked up at any of our restaurants, shipped within the the USA or emailed to you or your intended recipient. Cards may be used at any Alta Group location, they never expire and are valid until redeemed. Please note that Alta Group gift cards are not redeemable or exchangeable for cash or credit over $10, and no refunds over $10 are given on our gift cards. You may check your balance or reload your card online or at any Alta Group location. For gift card fulfillment inquires please use fulfillment@custcon.com. Mon – Fri 8am – 4pm Pacific Time.